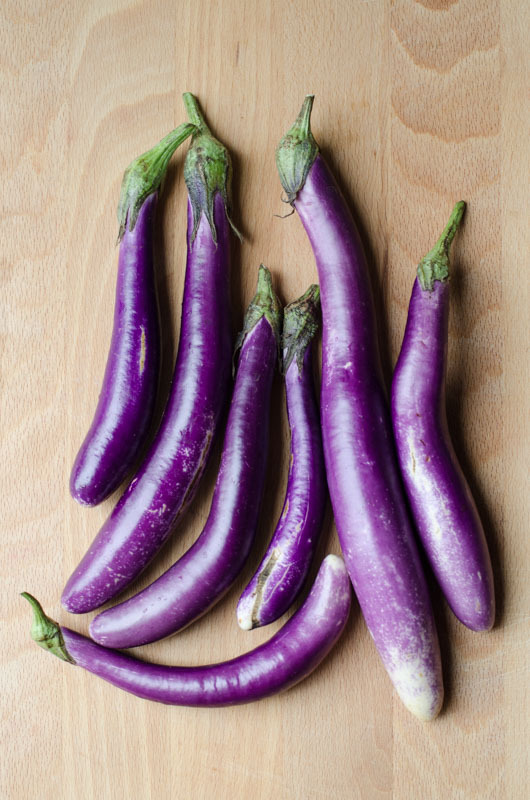 I love all kinds of eggplants! Have you got that already? 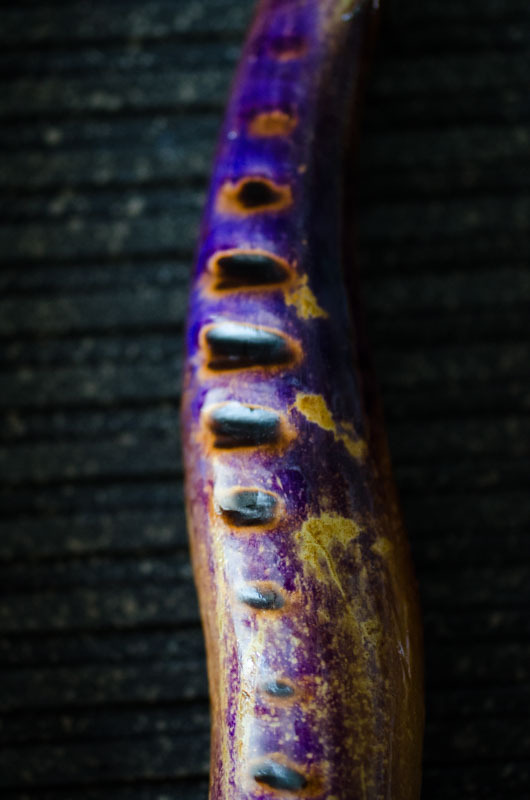 After the red ones from two posts back, today it’s all about these beautiful, long and thin, amazingly purple eggplants which, according to some research, are commonly known as the Chinese or Pingtung variety. In Italy we call them Perlina. Their flesh is more compact and less watery, which means it will absorb less oil, and the taste sweeter. No need to temper their bitterness or peel them as the skin is really soft and can (should!) be eaten. You just need to discard the stem. 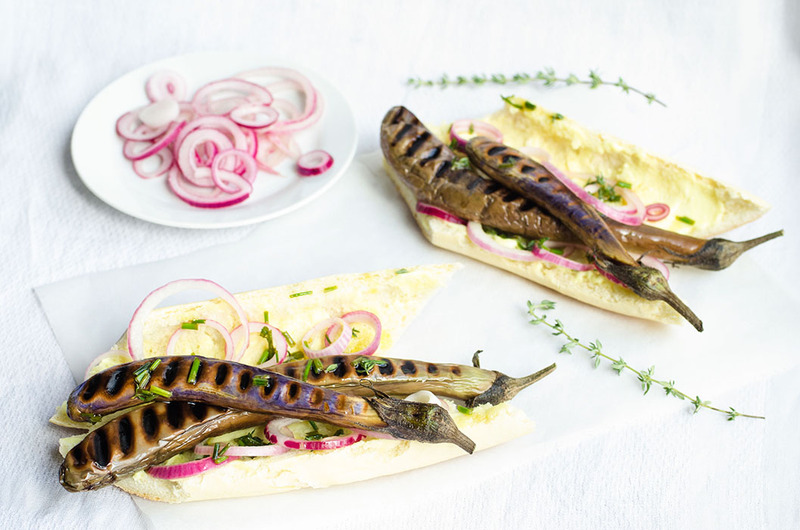 I think this makes them the best, most convenient and eco-friendly type of eggplant of all! 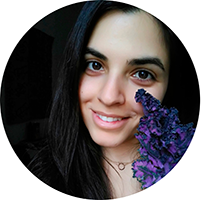 Should I be an eggplant vendor? The only down side is that, once cooked, their bright purple turns into a boring brown. 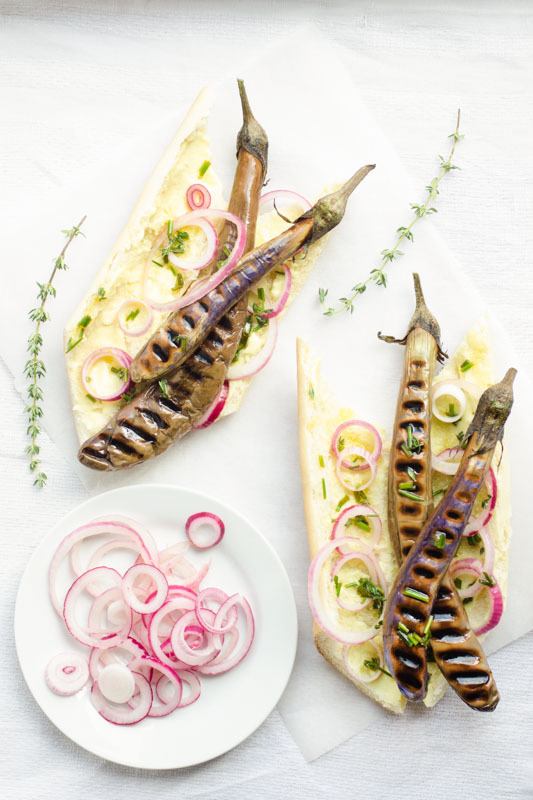 Baking or sautéing them is delicious but you will end up eating what resembles wrinkly sausages! After some trial and error I’ve decided the only way to prepare them – so that they look quite pretty and retain some of their amazing color (just a tiny bit) – is by grilling them. These hot dogs are super easy and quick to make. 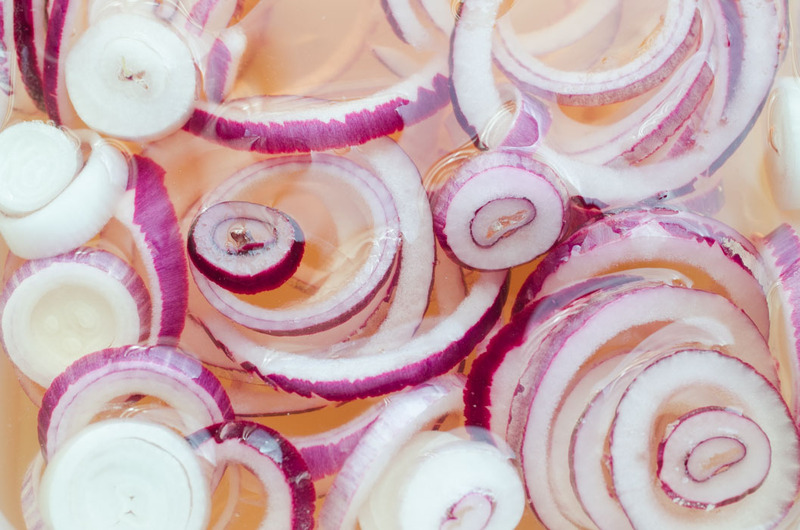 If you don’t feel like waiting the one extra hour for the onions to pickle you can cook them or eat them raw or sub them with something else! 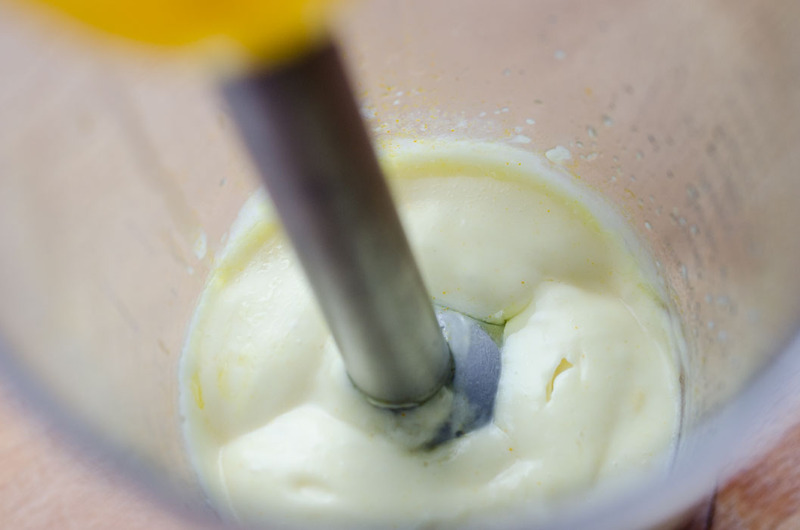 Put all ingredients in an immersion blender glass and blend, from the bottom up, for a few seconds. The mayo will be smooth and silky. Cover with plastic wrap and transfer to fridge to firm up while you prepare the other ingredients. Heat up a grill pan over medium-high heat. Wash and pat dry eggplants. Lightly brush with olive oil. 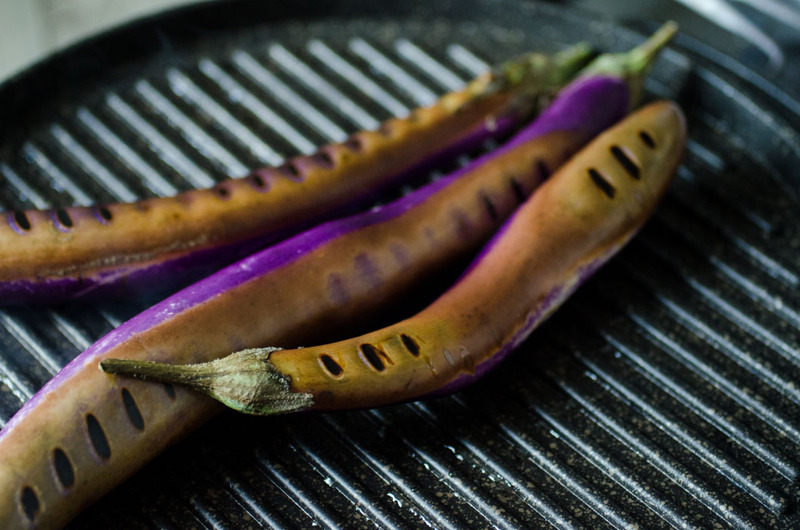 When grill is hot, place 3 or as many eggplants you can fit. Cook them for about 5 mins (without moving them around! ), then flip over and cook for 5 more mins. If they start burning lower the heat a little. They should be soft to the touch when ready. Sprinkle with some salt and set aside. Finely chop chives and thyme and add to a small bowl along with oil, salt and lemon, to taste. Mix and set aside. Whisk all ingredients (except onions) in a small bowl until sugar and salt dissolve. Add onions and let sit at room temperature for at least 1 hr. Drain before using. Can be stored in the fridge for at least 1 week (haven’t tested longer). 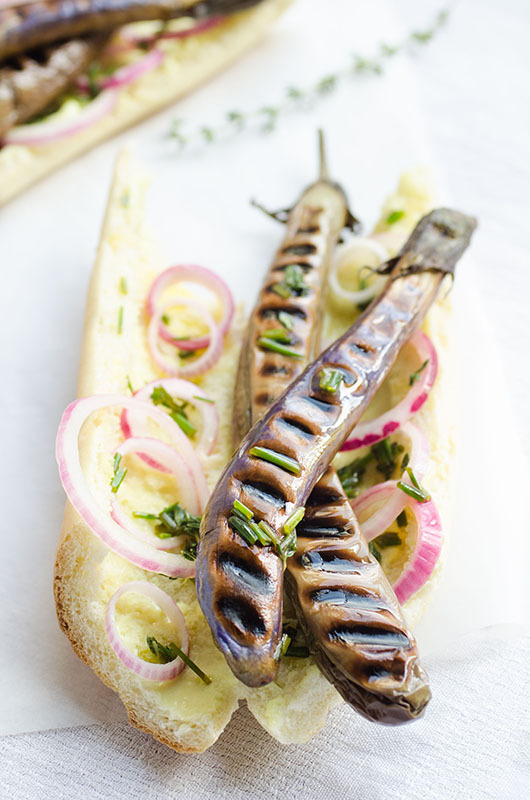 To assemble: spread a generous amount of mayo on both sides of bread, add 2 eggplants per bun, brush with herbed oil, add some pickled onions and you’re ready to go!